Okay, so artichokes are a food and not really related to travel, but they are related to travel, since the first time I actually ate an artichoke (and not just an artichoke heart) was on my first trip to Monterey. The artichoke is the official vegetable of Monterey and Monterey is one of my favorite California destinations, so it makes perfect sense that I write about artichokes. Not only that, but tonight I am preparing my first artichokes, so in honor of that, I thought I'd post about this great "vegetable." Technically, an artichoke is a flower bud, but whatever you call it, the artichoke is wonderful. 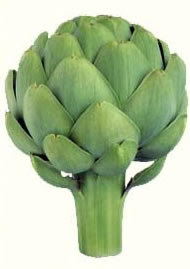 Artichokes are low in calories and high in nutrients, so they are a great food. They may seem intimidating to eat, but once you get the hang of it they're quite fun...since you eat them with your hands. You can find tips for preparing, recipes for using, and general information about the artichoke by visiting the California Artichoke Advisory Board; since virtually all of the artichokes grown in the United States are grown in California, these are the artichoke experts. You can also find out all about artichokes at the Ocean Mist Farms website; they are the largest U.S. grower of artichokes. If you've never tried an artichoke, I definitely recommend that you do. There is nothing quite like them. If you are in the Monterey area, then you will have no problems finding them on many local menus. Also, Castroville is home to the Artichoke Festival each May. This year the Artichoke Festival celebrates 50 years. So, whether you prepare artichokes at home, or eat them in a restaurant, they are an experience not to be missed! UPDATE: I fixed two artichokes and they turned out great. The same can't be said for the herb dipping butter I made...maybe next time I will try some aioli. For me, artichokes are strongly related to travel. When I was a kid we drove down to Monterey every year, and on the way back my mom would pick up a flat of fresh artichokes. Steamed, fried or marinaded artichokes punctuated each annual trip. We still eat artichokes, but they're from the grocery store now, and they always remind me of those trips to Monterey. That's a great memory to have, Debbie. Every time I go to Monterey (not often enough) I make sure to have at least one meal with an artichoke. I've tried them at restaurants where I live and they're just not as good as they are in Monterey.